Japanese high school kids fighting evil in secret. I’ve never heard of that premise before. No, wait. I have. Tokyo Xanadu is the latest JRPG from Nihon Falcom for the PS Vita. Knowing what time sinks RPGs can be, I figured I’d pass on this one. 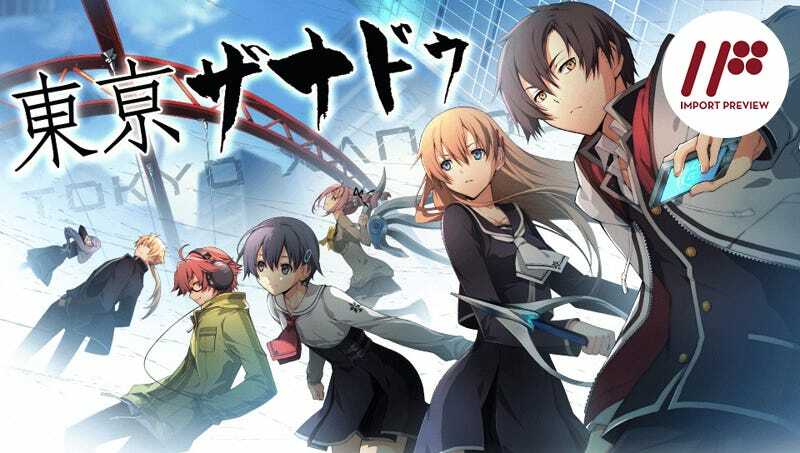 Falcom has been around the block a few times and they know how to make a solid game so despite the seemingly unending stream of advertising everywhere I went (game shops, game shows, magazines, whatever) I didn’t feel an overwhelming need to immediately pick Tokyo Xanadu up. Then I learned that the game is an action RPG. Action RPGs are totally my jam, so I hightailed it to my regular game shop on release day and picked up a copy. The story of Tokyo Xanadu takes place in an alternate reality where in the year 2005, a massive earthquake devastated Tokyo. Now, a decade later, the city has rebuilt and life has returned to normal. But underneath this reality lies another world. Kou Tokisaka is a high school student living alone and working part time jobs. One late night after work, he sees a classmate, Asuka Hiiragi being followed by some delinquents. Kou tries to intervene when all of a sudden he finds himself sucked into a strange dimension. In a word, Tokyo Xanadu is “Persona-esque”, though not as deep. From its premise of high school kids navigating an alternate dimension down to its system, the game shares many similarities with the Persona series of games—namely Persona 3 and 4. In between major dungeons, there is a free mode where you can explore the city locations and talk to characters, shop, upgrade your equipment, play minigames, train in free dungeons and spend time with major characters to build relationships with them. Hmm... Sounds familiar. The dungeons are where the game shines and the most fun is had. The game is an action RPG, so there’s no waiting for your turn or scene change when you enter combat. To attack an enemy, you simply hit the circle button. For long range or special attacks you press or hold the square button. To jump you press the X button. Hit it again for a double jump. The L button locks onto enemies and the R button is used for dodging and dashing. If you have enough energy, holding the L button and then pressing the R button will unleash a special attack. The triangle button switches your character. This isn’t a game where you have AI allies running about doing stuff to support you. There’s only one person doing the fighting at a time. Characters and enemies have different elemental attributes with various advantages and disadvantages, so switching out your characters depending on the enemy they’re facing at any given time is part of the strategy. Of course, each character has a different weapon with a different style of combat so sometimes it’s just easier to tough it through with the character(s) your most adept at using. While the game flows smoothly and the action is lots of fun, the default button configuration can be a little unintuitive and confusing at times—especially when you’re in a tight spot, surrounded by multiple enemies. Quite often I would accidentally switch out to the wrong character or lock onto the wrong enemy in chaotic situations. Graphics-wise the games isn’t anything overly spectacular, but the look of it works. For what Falcom has made, the game looks perfect. Not ultra-realistic, but comfortable and not at all shabby for a hand-held. The character design and CG models work together with the environment for a convincing game world. While the action of the dungeons is fun with challenge elements to make you want to retry them, the in-between free mode where the plot happens can be taxing at times. The way the game is designed, you end up having to run around talking to every single NPC on every corner of every map lest you feel you might miss out on something. Most characters have a character bio in the in-game SNS, NiAR, that updates whenever you talk with and find out something new about them, so if you’re a completionist like me, you’ll probably come to dread every time a story event ends and you’re given control of your character to run around the map and talk to everyone again. Eventually I began to resent the free mode because it kept me away from the more interesting dungeon exploration. All in all, Tokyo Xanadu is a familiar story in a solid package. The action is surprisingly well-made for a company that has generally seemed more at home with standard JRPGs and 2D action RPGs. However, the game doesn’t feel like it’s taking any risks. The story isn’t really ground-breaking, but is a reliable chestnut that doesn’t fail to entertain. The gameplay is solid, but nothing that really seemed to define it as its own thing to me. Tokyo Xanadu didn’t really blow my socks off, but I never regretted my purchase and certainly enjoyed the experience it gave me. Tokyo Xanadu is currently available in Japan on the PS Vita. No word on an Western release.